A Sikh postman at Disney World has won his fight over claims he had been made to work away from customers so they would not see his beard and turban. Lawyers for Gurdit Singh said he had been segregated from staff and customers at the Florida theme park because he violated a "look policy". Disney now says Mr Singh can deliver post on all routes, in full view of customers. The company says it does not discriminate based on religion. Mr Singh, who has worked at the theme park since 2008 but always out of sight of visitors, said he was "incredibly thankful" Disney had decided to change course. "My hope is that this policy change opens up the door for more Sikhs and other religious minorities to practise their faith freely here at Disney. "My turban and beard serve as a constant reminder of my commitment to my faith... these articles remind everybody that we're all equal. That's not just a Sikh value, that's an American value." In May, lawyers from the American Civil Liberties Union (ACLU) and The Sikh Coalition, an advocacy group for the religion, wrote to Disney expressing their concerns over Mr Singh's treatment. They said he had been assigned to only one delivery route which kept him away from customers, while other staff were rotated through different assignments where they were visible to guests. They argued this was "specifically, because of his racial/ethnic and religious appearance", and was a violation of his civil rights. Disney restored him to all the routes and said it is an "employer of choice that is committed to diversity and prohibits discrimination based upon religion." 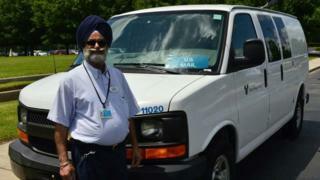 Mr Singh remains in his job in Florida, delivering post at the park, and says he is happy to work for the company. Gurjot Kaur, a lawyer acting for the Sikh Coalition, said that her client first applied for a job at Disney in 2005, and was told he would have to work in the back, cleaning the car park or in the kitchen. "The interviewer indicated that he could not work in front of guests because of his turban and beard," his lawyers said. Mr Singh didn't take up the position, but applied again in 2008, initially to work as a doorman. Despite extensive experience in hospitality, Ms Kaur says her client was denied the position "because his 'costume' did not match the 'costume' necessary," - Singh took "costume" to mean his turban and beard.